Vayu is the life – “praana” for the entire creation. Without “Praana” life will become stand still. The existence of a person is due to “Praana Shakthi”. Vayu Deva is unequaled in knowledge (Tatwajnana), Hari bhakti, Dhairya (firmness), Sthairya (Steadiness), Parakrama(valour), Vega (switness), Laaghava (brevity), Panditya (scholarship), Patutwa (skill proficiency), Prabhutwa (Lordship), Shooratwa (Heroism, Valour) as well as bhala (strength). Therefore he is no doubt the energiser of this entire creation. 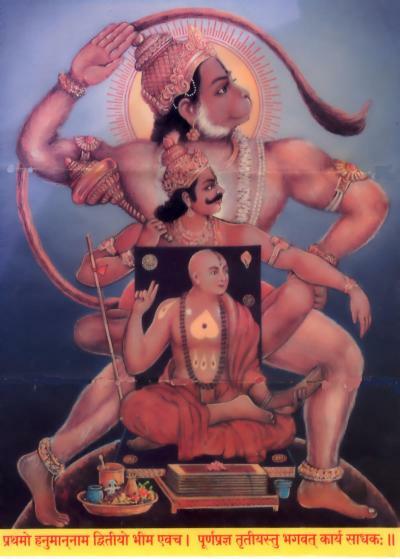 The first Avatar of Sri Vayu is Hanumantha. His wonderful feats and service to Rama Devaru are described in RAMAYANA. The second Avatar is Sri Bhimasena, in Dwapara Yuga, Sri Vayu Deva appeared as Bhimasena and played the most important part in the destruction of the enemies of God. Thus, he served God as Hanuma in Ramayana, as Bhima in Krishnavatara and as Madhwa, served Lord Vedavyasa Devaru. He is the greatest spiritual benefactor of mankind.